My twitter tag line says, “Author, Nurse Practitioner, Patient Advocate & educator. I love what I do; and am thrilled to be doing it” which does sum me up pretty well. 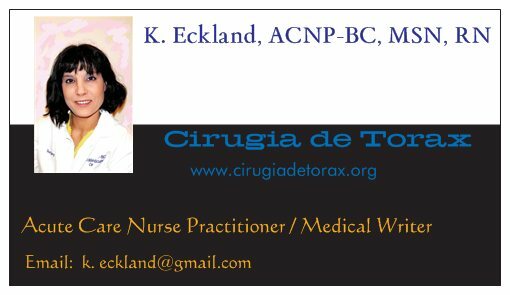 I am an acute care nurse practitioner in cardiothoracic surgery, and my work, really is my life, and my love. My job isn’t all that glamorous, but I do love it; because I care about my patients – and use whatever tactics I need (including nagging) to make sure they do well after surgery, and get to go back to their regular lives. I feel privileged that I am able to take care of people during these critical periods of their lives (during/after major heart and lung surgeries) and I take it very seriously. I also listen to my patients – and so many times, over the years, I kept hearing the need for more and better information, geared to their situations, in easy-to-understand terminology. They want someone to stress the parts that need to be stressed, because right now, they are facing something huge, frightening, and potentially devastating, so having someone give them the ‘Cliff Notes’ version can be helpful. But my patients also aren’t idiots – so they also want to know the rationale behind the medications, treatments, procedures and protocols. Just not all at once, sometimes.. So this is both the Cliff Notes, and the annotated works for Thoracic Surgery – for people to browse, read a bit, or come back for more in-depth articles and links to research. But, it’s a big job, so I am welcoming and encouraging contributors for article submissions. I enjoy reading all your research. Keep up the wonderful work. I am not familiar with Ecuador. Try contacting the Board of Dentistry, or alternatively the board of Medicine for more information. I was treated for a collapsed lung with a chest drain. When that failed I was sent home without any advice what to do next. Eventually I got fed up with waiting for surgery there and went to another hospital wher I had a thoracotomy. A very long operation after having had a collapsed lung for 4 months! A very unpleasant and frustrating experience. I am sorry to hear about your experience.. A thoracotomy can be very unpleasant especially when excellent minimally invasive options exist. Greetings from Chile. I’am a thoracic surgeon from Vaparaíso and i feel really surprised with your commitment with our surgical specialty and your excellent comments about these matters. I’m a personal friend of Dr. Gonzalez Rivas and in your site i`ve found a lot of material for my presentations and personal reading about him, and all the aspects that we deal with. I perform uniportal approach in my country for VATS lobectomies (in fact, i’am the only one who does it regularly in my country) and was very pleasant to find a place where read such a excellent observations and dedicated corresponsal work . Thank you. Please start (if you don’t already) collecting your data – and let’s plan on collaborating in the future.